Rule Kits are smaller modules designed to be easily adaptable to any setting you might come up with for Genesys. 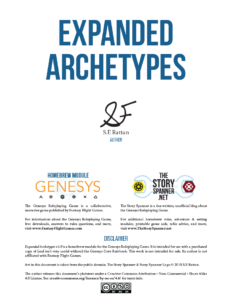 Three new archetypes for all human settings, allowing players to build characters focused around each of the six characteristics (when combined with the original archetypes provided by the core rulebook). The Disciple: a true believer focused on Willpower. The Gymnast: a highly trained athlete focused on Strength. The Rascal: a clever, fast talking wildcard focused on Cunning. Transform into a vicious chiropteran (bat-like) monstrosity or summon a horde of bats to harry your foes! Strike from the darkness or risk the daylight. 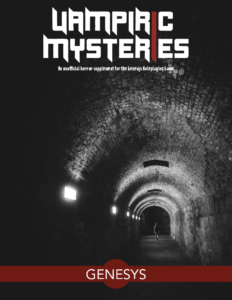 Vampiric Mysteries is a module for parties and game groups who want to play as vampires. A detailed career option with vampiric abilities inspired by the heroic abilities in Realms of Terrinoth and fifteen unique talents.